I downloaded program and had a good look at it. 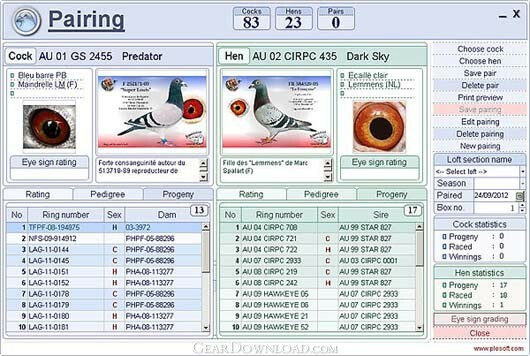 I have tried some programs and not one of them even came close to the Pigeon Loft Organizer. I cecommend the Pigeon Loft Organizer to every one I know. This download (demoen.exe) was tested thoroughly and was found 100% clean. Click "Report Spyware" link on the top if you found this software contains any form of malware, including but not limited to: spyware, viruses, trojans and backdoors. Shakespeare and the Bible 1.0 - Note and greeting cards with quotes from Shakespeare and Bible, ready to print. Bible Collection Plus 1.0 - Note cards with quotes from the Bible plus planner, formatted and ready to use. Goa 1.02 - See and experience the breathtakingly beautiful beaches of Goa. 1-abc.net Birthday Reminder 6.00 - Never forget to congratulate your friends, colleagues and relatives again! Custody Toolbox 2.0 - Take control of your custody situation with Custody Toolbox. NOW VERSION 2 !! !